This beautiful wooden wall hook adds a country farmhouse accent to any decor. 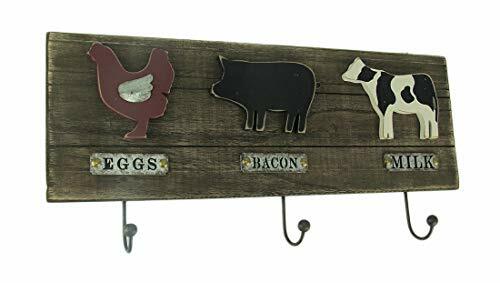 Made from recycled wood and metal, the wall hook features a chicken, pig and cow across the weatherworn panel base, with galvanized zinc nameplates reading "eggs", "bacon" and "milk" underneath. A trio of metal hooks with ball ends hang underneath, ready to hold coats, scarves or even coffee mugs. The wall hook measures 22 inches long, 10.5 inches high and 1 inch deep. It's a wonderful addition to country kitchens, hallways, bedrooms or mud rooms, and makes a unique gift. If you have any questions about this product by Direct International, contact us by completing and submitting the form below. If you are looking for a specif part number, please include it with your message.